I can’t thank you enough for your continued support. We know that many of you look forward to a glimpse into the lives of our elderly friends and volunteers in our monthly letters. Thank you for your enthusiastic responses! Below please find a birthday tribute to our elderly friend Ellen. We are so very lucky to have her example to live by–at 99, she is a woman of strength, humor, good health and good will. On Easter Sunday, our forever friend Ellen turned 99 years old. If ever there were a reason to celebrate a person living nearly a century on this planet, it’s Ellen. She was born in the Keweenaw to a family of 14. She had the dubious honor of being the eldest daughter—a position that made her the second mother to all her younger siblings and responsible for their care. Even though she showed more aptitude for academics than her older brother, she wasn’t allowed to go to high school because “there were all those children to look after.” She shrugged, explaining how different things were when she was young. “I cried and begged, but they wouldn’t let me.” Her voice was steady, with the grace of someone who had come to peace with her past, but still could see the unfairness of keeping a bright girl from being educated. Shortly afterwards, she met and married her husband, and began the new chapter of rearing her own two children. She remembered spending good times with her husband at Burrough’s Farm, a kind of retreat center open to company employees. It took eight years for a spot to open up at the farm, but when it did, Ellen and her husband jumped on it, and spent many a month there in their trailer with other young families. They had a golf course and all the amenities. “It was like being part of a real ritzy club,” she laughed. She eventually moved back to the Upper Peninsula where her parents and many friends still lived, continuing to live an active life—literally. Up until she was 89 years old, she swam at the Suomi College pool and regularly walked 3-4 miles a day. After walking all the way from Hancock to Houghton across the lift bridge, she would call the city bus to drive her the rest of the way. She joked that the hill was so steep that one day she was leaning so far over she thought her chin would scrape the pavement, so decided on the bus as a compromise. At 99 she still has a sharp mind, but explains that the worst part of aging is the fatigue. 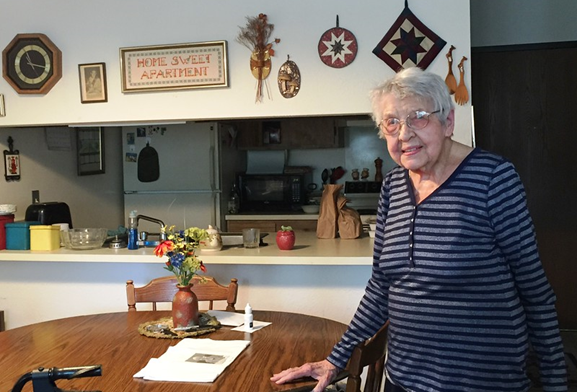 “I just get so tired out,” she says, “It’s so hard to get around.” She admits that these limitations keep her at home where she plays Pinochle, completes crossword and jigsaw puzzles, has occasional visitors, and reads. “I always try to have a book around,” she says, and when asked what kind of books she likes, she answered, “Something to hold my interest—and something with clear print!” That pragmatic answer seemed to capture her in so many ways—someone who demands little, and yet is able to take great satisfaction from the simple pleasures life offers us all. Sometimes the most extraordinary among us live ordinary lives. Ellen’s grace and kindness, her curiosity about the world and concern about others is an honor to behold. To encounter a woman nearly a century old who is at peace with herself inspires the rest of us to take life as it comes, savoring Lake Superior’s breeze, a bucket full of berries and a good crossword puzzle, one berry, one word at a time.